The 3DS eShop is set to launch next month, and global retailer BestBuy is gearing up for the launch by listing the first 3DS Cash Card. As noted in our mammoth 3DS FAQ, the eShop will ditch Nintendo Points in favour of a cash-based system, where game prices will be displayed in the region's local currency. Best Buy is currently taking pre-orders for $20 cash cards to top up the eShop's eWallet, though we're still awaiting price details for games downloaded from the 3DS store. We'll keep you updated on eShop information as it arrives. Your Nintendo 3DS delivers awe-inspiring graphics and glasses-free 3D visuals, providing you with the most immersive handheld gaming experience to date. From updated classics to augmented reality to 3D photography, the 3DS delivers a wealth of options that you love. 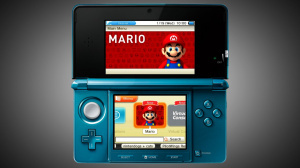 Why not completely expand your 3DS experience with the help of this Nintendo 3DS Cash Card? Replenish your Nintendo 3DS eWallet with this Nintendo 3DS Cash Card. Get the full multimedia experience on your 3DS with downloadable games, add-on content, 3D video on demand and a new eShop. The new eShop features demos, game trailers, user ratings and previews. Use the funds in your wallet to purchase classic Gameboy and Gameboy Color titles and download them directly to your Nintendo 3DS for some on-the-go nostalgia. Thanks to komicturtle92 for the tip. I'm already setting aside some cash. Come on e-shop!! Complete with 18 Month Financing options for your cash card. w00t! Can't wait to see the first batch of games, I hope Nintendo realizes that consumers want more (and better) games for download! Really can't wait to buy some old Game Boy games! What bothers me is the idea of an eWallet. Based on screens I've seen and now this news, it sounds like you'll have to pay in possible monetary increments. That makes it no different than the Nintendo Point system if that's the case. Ah, well only makes sense that Nintendo will do this so that gamers who don't have credit card and still get eShop stuff. it will be hard to just get 20bucks cards...ill go for a 40 ! I hope nintendo announce the launch date along with the 3dsvc and 3dsware launch games soon. Shame there's not a real date for when this will be released. If you check the estimated arrival date, it says between 4/28-5/3, but I doubt they'll actually be shipping cards today. I am very curious as to when in may we'll see this update! Oh, uhm, thanks for pointing me out James. I couldn't find the estimated arrival thing hoping we would know around what time we'll get that nifty update. In the description, it mentions demos which I'm REALLY excited for (though, I hope they are not PAID like the Magaman Legends 3 game but there's a reason why we have to pay). I can't find the cash card under 3DS' pre-orders, just Wii. Most likely an error by Best Buy. I don't quite get it. Is this card going to be needed in order to download from the Eshop or are we still going to be able to use our Debit cards? Unless its forced to get this thing to use the Eshop or unless it comes with preorder bonuses i will pass. Let's just hope we don't get the PSN card double-tax. I'm assuming a hybrid. Like the Wii Shop Channel. I just don't want to buy cash with my Debit Card. I want to be charged directly like on iTunes/AppStore and PSN. I'm really hoping they do it THAT way. I was hoping for a system where you would just pay the dollar amount charged per game instead of having to use any sort of prepaid system. You know, I just want to give the system my credit card number and just spend the money on the game I want. I don't want to have to, say, spend $10 to get a $2 game for example. It also means, once again, I will likely have to enter my credit card information over and over again every time I want to buy a new game. That's a pain. I was just planning on using my credit card this go around, instead of waiting for sales on points. It'll be interesting to see how it goes this time, though. Does anyone know how exciting 3DSWare really is?? Let me go through my reasons for being jacked up like I'm on a constant Mt. Dew high. #1: we're getting old school NES games w/ a 3D kick. That's Mario Bros., Contra, Mega Man, Excite Bike in 3D. I can't even imagine how awesome that is. #2: We're getting Game Boy, GB color, Game Gear, and TG-16 games for download and maybe even GBA games eventually. Be sure to check out Game Gear Shinobi. I've never played it but look up reviews for it and it's 9s and 10s across the board. I love me some Shinobi if you couldn't tell by my name. #3: MOST EXCITING-3DSWare games. Wiiware games are good, but there's one problem. The file size is really small. That means 10-15% of the best Wiiware games never got made b/c they were too big. 3DSWare games have a bigger file size. Get ready to have your mind blown! Other 3DS games to be excited about: Williams Pinball Collection. I had that for Wii and it is the best pinball sim I've ever played, more fun that being at a real arcade!! And saving the best for last...hopefully this gets announced at E3: Metroid Prime Hunters 3DS. It's amazing how good Prime Hunters was on DS's puny hardware. Imagine what they could do on the 3DS. It's scary. But in case that doesn't get announced, the Conduit 3DS is still getting made, so we will have an extreme 1st-person shooter in our future. Pre-ordering virtual money? No thanks. Between the Eshop and OOT my wallet may never forgive me. I shall wait and see. But first I gotta find a way to get the update that includes the eshop first. .-. Borders's wifi kicked my 3DS off the wifi and the Starbuck next to the store won't let me connect....somehow I was able to get Vicitini's Liberty Pass with my DS Lite last month but no luck with connecting again for my 3DS. It is a pain having to enter credit card information in every time but on the upside it means that the information won't get stolen, unlike other services where the possibilty exists (most recently highlighted by the PSN issues). The part that excited me the most in the product features list was where it says '3D video on demand'. I just can't wait for 3D videos and Netflix streaming. What I would really like from the points system is more flexibility. I already prefer the Wii points system to the XBLA system as it is easier to equate a dollar value to them ($10 = 1000 Wii points as opposed to $10 = 800 MS points), but I'd really like to be able to buy a $20 card and use $10 on the Wii and then $10 on the 3DS.